Hand pieced patchwork quilt with 10 diamonds consisting of hexagons with white and black rows as edging. Materials include furnishing and dress materials and a type of linen. It is not quilted or tied. The backing is a small floral print in flannelette. The hexagon diamonds were hand pieced by Delores (Babs) Taylor in England during WW11. 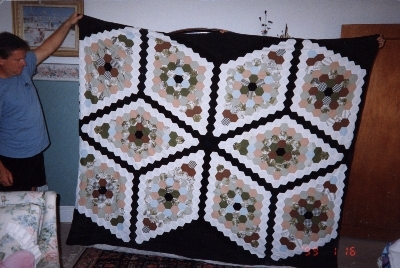 The black and white hexagons and the backing were added by Elsie Towers, the present owner's mother, in Australia in 1982. It is not used now. 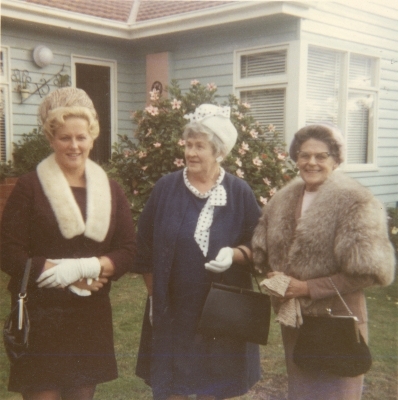 Babs Taylor migrated to Australia from England after the war. She died in the late 1970s.